This was a very good, heartfelt post. It makes me sad that you are experiencing wounds of our Alabama culture that are still being healed. I hope, and believe, that in a generation much of this fear of people that are different will fade away. But I am a tired Alabamian. Sometimes it seems like it will never end. Sometimes extreme issues call for extreme measures. 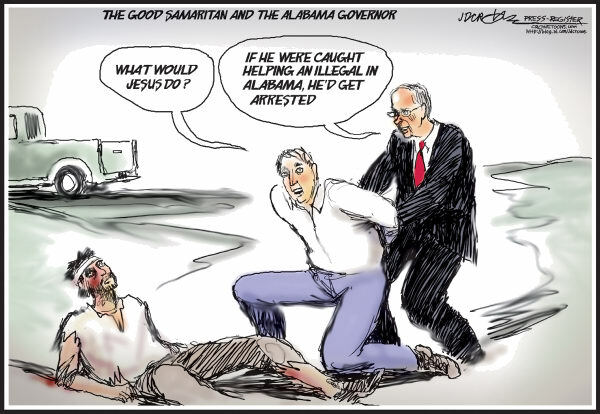 Rather than hold Alabama (or other states for that matter) accountable, why not look to the real culprit, a useless and outdated mode of national government. We’re facing this now, much like our debt, because it’s an issue that’s been swept under the rug for decades. 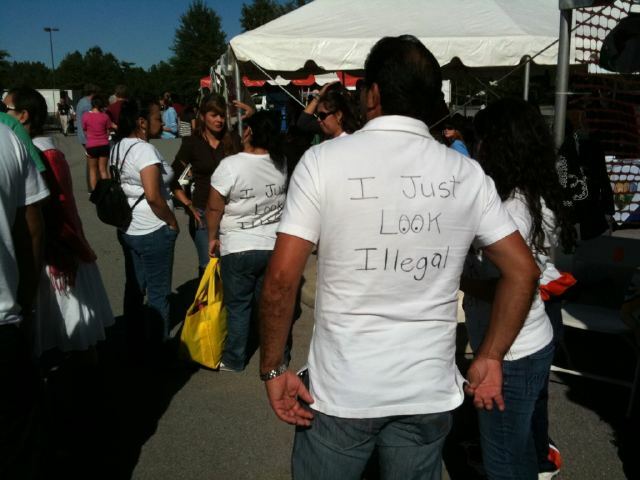 What I can’t understand, is why intelligent, caring people can overlook the meaning of ILLEGAL. In my opinion, stop comparing the civil rights issue with the illegal immigration issue. Their is nothing to compare. The fact is that our government has ignored the fact that people have been coming to this country and staying illegally for decades, straining our infrastructure, driving up taxes, overcrowding schools, using our medical resources, and for free. If you owned a business, and people walked in and took items off the shelf and walked out, you would want them arrested. Coming into this country, working without paying taxes, sending your kids to public schools, driving on our roads without having proper insurance, is STEALING and ILLEGAL. Why not move to Texas. Here, we have lots of illegals. They line the streets trying to grab any job they can. When they can’t find work, they steal. They drive up insurance, and drive down wages and property value. That’s what they bring to this country. I understand people want a better life, and if that’s the case, get in line and do it legally. Any other avenue to the US is criminal and should be treated as such. I will publish most comments, but here is my response:. “Sometimes extreme issues call for extreme measures”. This sentence, in and of itself, may be OK. But recourse to racial profiling, which is making a judgement based on race, which is the definition of racism is never acceptable. ” why not look to the real culprit, a useless and outdated mode of national government” I in no way blamed Alabama for the situation per se. I simply said that this measure was NOT the answer in a civilized society. I am glad you 1/2 agree. “What I can’t understand, is why intelligent, caring people can overlook the meaning of ILLEGAL” I don’t believe I ever did that. Thinking that ‘I don’t support HB56’ = ‘I support illegal immigration’ is like thinking ‘I support our troops’ = ‘I am a war mongerer’. You sound very foolish and ignorant. “Here, we have lots of illegals” If you would like to comment on my blog, please refrain from using offensive language in future. Interestingly though, I have applied to Texas for a job. “When they can’t find work, they steal.” Glad no Americans do this. Oh…. wait…. “They drive up insurance, and drive down wages and property value. That’s what they bring to this country.” And your economic evidence for this is…? “I understand people want a better life, and if that’s the case, get in line and do it legally. Any other avenue to the US is criminal and should be treated as such.” What you have missed, with your ill-thought out tirade (and I urge you to go and read the post again), is that I, and most HB56 dissenters, in NO WAY think people illegally in America have the right to stay there. What we do believe is that allowing racial profiling, that giving different rules of protection to people who don’t look and sound American is wrong. 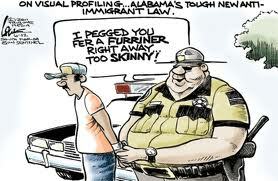 Hence, if you would like to read carefully, I suggest the AL implement laws that apply to ALL people. ALL people show legal status documents at crime scenes, or upon arrest. ALL show such on entry to high school. 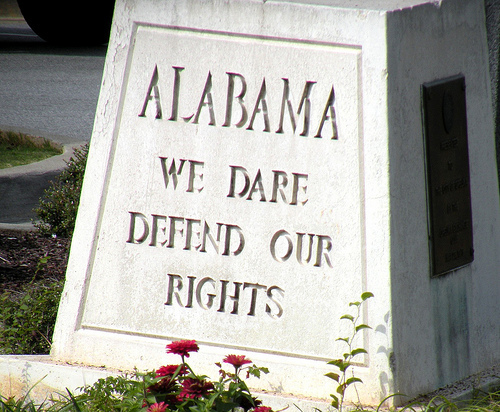 But Alabama doesn’t like that, because many people here are sadly, racist. Unfortunately, the pervasive view of racism here is 20 years behind the rest of the Northern States and Europe, where making it legal to make a judgement on someone because of their race and allow the potential to apply different laws to different races in unthinkable. They may likely day catch up, especially when they realize that (1) very few of the doctors and academics fueling the UAB-revitalization of Birmingham come from the state with one of the lowest education attainment standards (even of the ‘legals’: to borrow your offensive parlance for one angry minute) and (2) Ooooops, you lil’ racist states-people (not all Alabamians, just the racist ones here, for clarification) have devised your state’s economy so that you need foreign influence. I welcome that day, and until then, I leave here.